INDUSTRY.co.id - Jakarta - From year to year, Jakarta Fair Kemayoran always presents multiproduct quality in the country, ranging from electronic products to automotive. This largest, longest, and longest exhibition event also provides attractive promos and special discounts during the event. This is the main attraction of visitors who want to find high quality products with low prices. This year, smartphone products become one of the most sought after products in Jakarta Fair Kemayoran 2018. 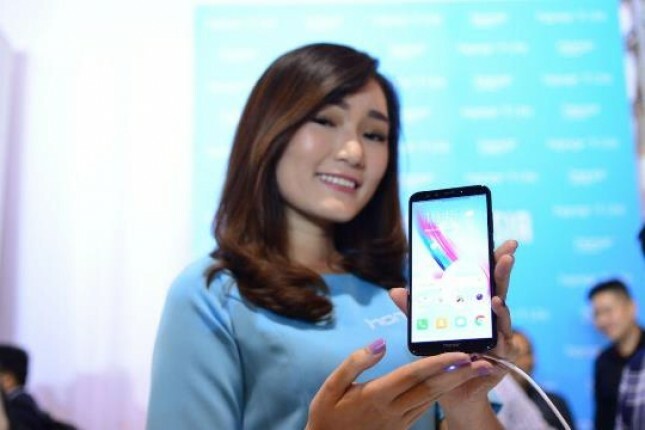 Stan smartphones competing to get the attention of visitors by offering various promos and special discounts at the Jakarta Fair. Booth smartphone participating Jakarta Fair Kemayoran 2018, Erafone, iBox, Telesindo, Sentra Ponsel, Samsung, Advan, Evercross, and many more. In addition to promos and discounts, each booth also provides ease in shopping, such as 0% interest installment as did Erafone. According to Indrawan as team leader Erafone, Jakarta Fair Kemayoran 2018 visitors from day one until now crowded visit to the booth. "Since the first day lasted until now the visitors are still crowded. Many visitors come to the Erafone booth for ease of payment, for example 0% interest installment. In addition, visitors who do not have a credit card can also pay with Specta, HCI, or KreditPlus, "said Indrawan. "The first order is Samsung. Secondly there is Oppo. The third is Vivo, the Fourth is Xiaomi, "said Indrawan about the smarthone brand that sold the most Erafone booth during Jakarta Fair Kemayoran 2018 took place. Meanwhile, according to Telesindo booth supervisor, Jonathan said the best selling product in its booth is Samsung. Then new Vivo, Xiaomi, and Blackberry are almost the same sales. Stan Erafone will also provide attractive promos before closing, which is by holding auction of display products from smartphones that are available starting price of Rp 99.000. Meanwhile, according to Indrawan Erafone booth has a sales target of up to 23 billion rupiah during the event. "Our sales target reached 23 billion rupiah. Alhamdulillah until now, we have managed to reach 24.5 billion rupiah, "he said. Meanwhile, according to Jonathan, Telesindo booth has managed to sell smarphone units up to about 1700 units. The number of figures can still be increased until the closing of Jakarta Fair Kemayoran 2018. Because Telesindo booth since Wednesday (27/6) and then give an interesting promo, that is by holding lucky dip to the visitors. In a day there will be two lucky visitors who get two smartphones.